ASCOM calcium carbonate (calcite) is one of the purest and whitest in the world, widely used for paint, paper, plastics and other uses. 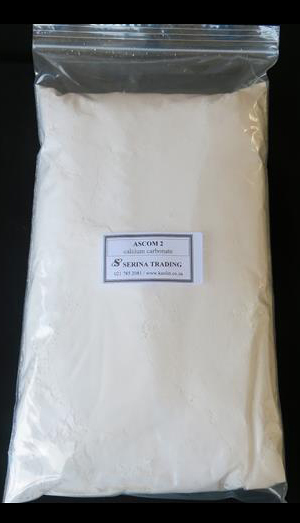 ASCOM 2 is a very fine and pure calcite powder which is also used to increase the pH of borehole water and other acidic waters in an efficient and cost-effective manner. In the presence of acidic water ASCOM 2 dissolves, neutralizing the water and rendering it much less corrosive to pipes and plumbing. It is only reactive in the presence of acid. In neutral or alkaline environments, it is inactive and insoluble. So once the water is neutral, ASCOM 2 becomes inactive and the water remains neutral. Method: It is important to know that ASCOM 2 should not be added as a dry powder, nor should it be allowed to stand in water, because then it becomes de-activated by an outer layer of precipitates. It needs to be kept in suspension by being pumped around or agitated until the right pH is reached. Vigorously mix the required dosage in a bucket of water (by hand or use a stirrer), then immediately add it to the vessel of water that needs to be treated. Pump the water around in a circuit, until the pH has reached neutral (7 – 7.5). This should only take a few minutes. Once neutral, the pH will not continue to rise. Recommended dosage: Add 100g per 1000 litres for each pH unit increase required. Example: to raise the pH 2 units from pH 5 to pH 7, use 200g for each 1000l treated.